It was bound to happen. 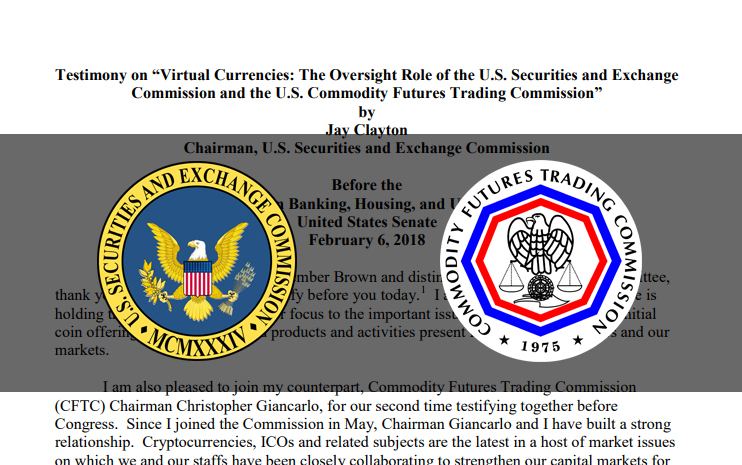 Congress has summoned the heads of the Securities and Exchange Commissionand the Commodity Futures Trading Commission to tell them about Cryptocurrency. I suspect this will generally revolve around the volume of fraud present in Initial Coin Offerings but may also delve in to what role, if any, either agency should play in regulating crypto markets or even recognizing crypto currency as a legitimate security. And not to throw water on the atmospheric dreams of some, I doubt we’ll see the day where Bitcoin has a CUSIP number. Personally, I’ll be tuning in to this particular hearing in the hopes that Christopher Giancarlo, the CFTC chair, might divulge some sort of news about Tether, though it’s not mentioned directly in the released prepared statement. [Official Link] I suspect if Tether is mentioned at all it will be somewhat cryptic.